A talented musician, Baker became renowned for his varied renditions of “My Funny Valentine”- a song which he became intimately associated with for the rest of his career. Much like the pure vocals of Baker, the watch features a perfectly formed stainless steel case, with double curved sapphire crystal and a non reflective coating on the inside. The beautifully engraved case back features a silhouette of Baker with his trumpet, and the watches limited number, 1929 - the year of Baker’s birth. The musical theme of the timepiece is continued on the face of the watch. The crisp black dial provides a smooth backdrop for the hour indexes which are bars from the song “My Funny Valentine”. The 12 o’clock position features a beautiful little clef, while the double bar line at 8 o’clock represents the first eight bars of the song which have to be repeated. The black leather strap with croco imprint, and a stainless steel folding clasp ensure unrivalled comfort for the wearer- allowing them to carry the legacy of Baker in a special and intimate way. The watch is presented in a unique box with a mechanically driven metronome, the perfect finish to a truly elegant timepiece. 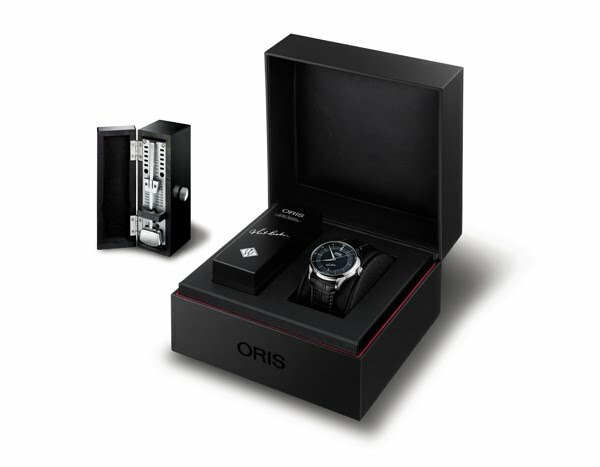 • Automatic movement Oris Cal. 733, based on SW 200. • Stainless steel case with double curved sapphire crystal with non reflective coating on the inside. • Date at 6 o’clock. 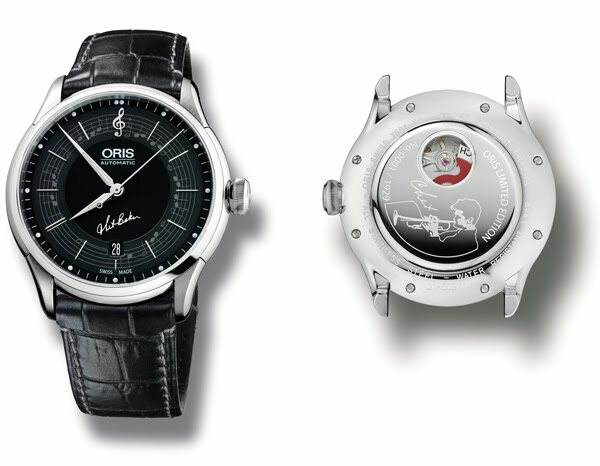 • Special engraved case back with silhouette of Chet Baker and engraved limited number. • Black dial with applied indexes and a subtle background printing of the “My Funny Valentine” tune. • Polished Nickel hands with Superluminova inlays. • Black leather strap with croco imprint and stainless steel folding clasp. • Special box including a mechanically driven metronome. • Water resistant to 3 bar / 30 meters.